Property taxes generated by the countywide tax rate represent 67 percent of the county’s general fund revenues. Property taxes help support programs and services that do not have offsetting revenues or pay for themselves. Examples include law enforcement, social services, parks and environmental programs. Other tax rates controlled by the county include Emergency Medical Services and fire districts in unincorporated areas. 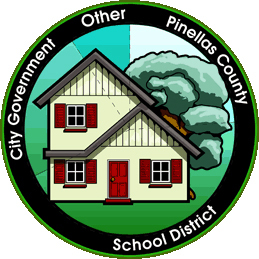 Property taxes are collected from more sources than just Pinellas County Government. In fact, the part of your tax bill that is set by the county is about 24 percent of your total bill depending on where you live. Separate taxing authorities control the other parts of the bill and Pinellas County government has no control over those rates. Hover over the graphic to the right to illustrate the breakdown.